And just like that we have an answer. Go Tiger-Hawks! Obviously we should have put some more library grease into it, but… yeah… it was just so much quicker to crowd source conspiracy theories. 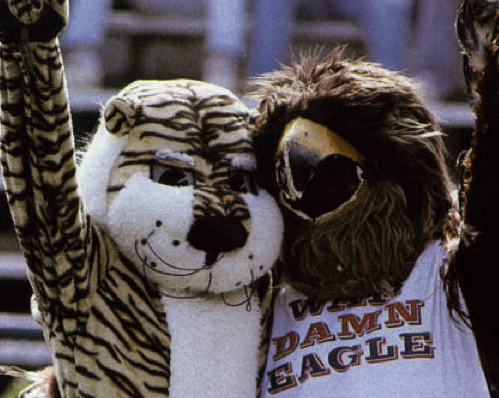 What’s the deal with that photo of Aubie palling around with what looked like an anthropomorphic Auburn eagle at Auburn’s 1987 game against Mississippi State? Ask and you shall receive insightful comments (thank you Matt Maslanka and AuburnTygrl). At the beginning of the 1987 school year, St. Joseph’s University, a Jesuit school up in Philadelphia without a football team to cheer for, decided they’d adopt one to cheer for. They printed ballots in the school newspaper and put it to a vote: Notre Dame? No. Penn State? No. San Jose State? No. UCLA? No. Auburn? Yes. And cheer they did. In fact, promised free tickets and champagne breakfasts (no joke) by Pat Dye, a bunch of them drove down for, you guessed it, Auburn’s homecoming game against Mississippi State—100 of them to be exact… and one hawk (The Hawk Who Will Live Forever) that looked killer in a “War Damn Eagle” shirt. They came back in ’88 and ’89, too, and kept up with Auburn “Tiger-Hawks” football for four years through the student paper. Kind of weird. But definitely cool. And if you think about, in a certain sense, Auburn did have a giant eagle mascot for a day. It was just, you know, a hawk. We still hold out hope that somewhere, perhaps at the bottom of Lake Martin or deep in the Bag Man’s lair, Professor Tazewell Morton’s eagle lies waiting to hatch. Related: Mystery of the University of Alabama White Bear solved! / Auburn almost had a giant eagle mascot instead of Aubie. Good Gawd, that was 24 years ago? I was a kid at that game in ’87. We still talk about that hawk walking up and down the side line slowly flapping its wings for 3 hours. I can remember watching the Hawk flapping his “wings” the entire game, too. Only later did I find out why, as stated above. It was really neat to see all their fans at the game. I remember it was a pretty big deal on campus. There were stories in the Plainsman (I think– don’t know where else I would have heard so much about it) and everyone was talking about it. I just wish they could’ve seen better games– the Miss State games back then weren’t all that competitive!